Are social media and mobile apps causing e-mail usage to rise or decline? Take a guess before reading the information below. (Note: A special thanks to Morgan Stewart, director of research and strategy for ExactTarget (www.exacttarget.com), for this data). 44% of people who used social networks more also use email more often, which suggests that social media is driving some increase in email use. 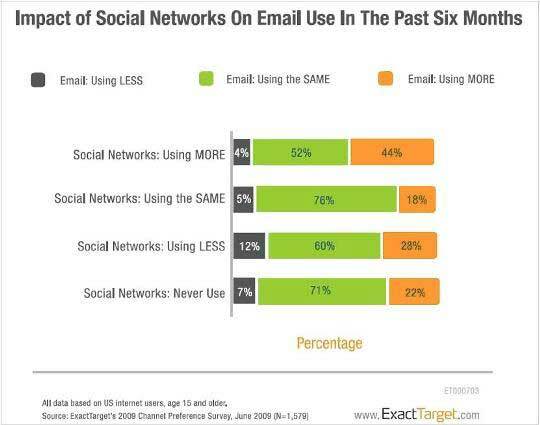 However, the finding that the 22% of people who never use social networks report also using email more, compared with only 7% who are using email less, suggests that the increase in email use is attributable to more than simply social media. What other factors would you say are influencing this?